And you thought this day would never happen! I’m of course talking about Lightroom’s GPU support. It allows us to have much more responsive processing, the sliders respond quite instantly to new values. But wait, there’s more. LR6 also has some new API calls for plugins to use – unfortunately it is yet undocumented. I have however spent this week’s nights mostly reverse engineering the API, and I’m proud to present Knobroom v0.3 which has partial support for new LrDevelopController API, which seems to be a new way of setting develop sliders. Here’s a little demo of the speed, recorded on a two year old MacBook Pro Retina 13″ using the Intel GPU. Those of you who have Mac Pros might get even faster response? And how does the new API help? On the video, note how the slider section changes depending on which control I am moving. Also, see at 30 seconds where I am changing exposure and vignette with two hands, which results as a “Multiple Settings” history entry. I addition to faster response, the API also seems to provide method for accessing different tools, and when the Adobe chooses to document this, I will add more functionality for the plugin. Slight note: the new API only works in Develop module, meaning that the knobs do nothing if you are in Library mode. These are on-the-edge versions from source repository, not tested and highly unstable versions. I’m planning to implement a couple of more features before actually releasing a more stable beta. For issue and feature management, I’ve set up a repository at https://github.com/jarnoh/knobroom/issues If you run into any issues, please submit a ticket there. Looks like Thomann has just dropped the price of BCF2000 MIDI controller, it’s now at 125-129 euros (depending on your domestic VAT). Doesn’t seem to be in stock currenly – “shipment due to arrive on 10.12.2010”, but this is still the cheapest price I’ve seen for it. Thanks for the effort, Sean! I do have a Akai LPD-8 controller in the closet, I probably should investigate how it works with the current version. Akai has 8 velocity sensitive buttons (think of it as a small drum pad) and 8 rotary knobs. I’m also working on the 0.2 release, which has been taking a bit longer than I had hoped. One of the excuses is that I’m replacing the control assignment display. It was already a bit slow to initialize, and there will be many more options in the future releases, so it also needs some kind of grouping. Someone asked what values exactly is The Fader scaling, and what’s not being faded from preset into another. In short, all the Lightroom’s numeric sliders I could think of are linearly interpolated between the current image settings and the chosen preset, but only if the preset sets new values for that value. This way, you can apply e.g. sharpening preset and still keep your cross-processing look the same. All attributes that select process or enable Auto-something, e.g. Defringe, vignette style, constrain crop, auto-exposure…. All values are interpolated linearly, except RAW white balance, which is (since v0.2) interpolated using 4 linear functions. This combination was figured out by dorfl68, the author of Paddy – thanks! Outside 0-100% weight, it is still using the same linear interpolation, but as the value can go outside the proper range, clamping function kicks in. Without clamping, Camera RAW would just forget that the value is set at all. After all the necessary values are interpolated, The Fader creates a “plugin develop preset”, which is then applied on the image. Every time a preset is applied, a new history entry will be visible on the image. Unfortunately, there is no way for me to prevent this, it’s part of the plugin API. Here is the long list of Camera RAW internal develop settings which the plugin is using. If you notice anything missing, or values that have incorrect values, please get back to me! First the good news. 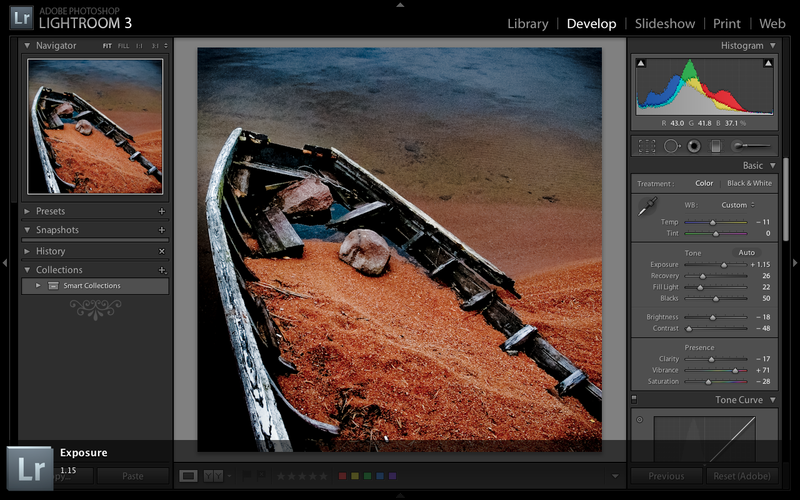 Adobe Lightroom 3.2 update is out. Bad news, the update wizard conflicts with Knobroom’s startup, meaning that both update dialog and Knobroom start dialog freeze and you have to kill the Lightroom task to solve it. Workaround is to temporarily rename Knobroom.lrplugin folder, run the update and then rename directory back. Sorry for the trouble, I’ll try to figure out a way to start the plugin without interfering with the built-in updater. As said earlier, I have only 8 knobs in my MIDI controller, so not all of the controls in Lightroom are directly available. Novation’s software provides several pages of controls, but when the controls are changed, it becomes very hard to remember which one is which. For next release, I am planning to include on-screen notifications using Growl. Growl provides somewhat coherent way to display notification messages on screen and it’s available for both OSX and Windows. Here, I’ve adjusted Exposure to +1.15. If you adjust multiple values at the same time, it picks one value to show – this might need some fine-tuning later on. But even now, it really helps if you lose track of which knob is which. Implementation is currently just executing the growlnotify command from plugin server. My next task is to get the same functionality to Windows version, as I’d like to keep same features on both platforms in each release. continuous controller knobs or faders. Knobroom.lrplugin and click “Add Plug-in”. always listens to all MIDI In channels. 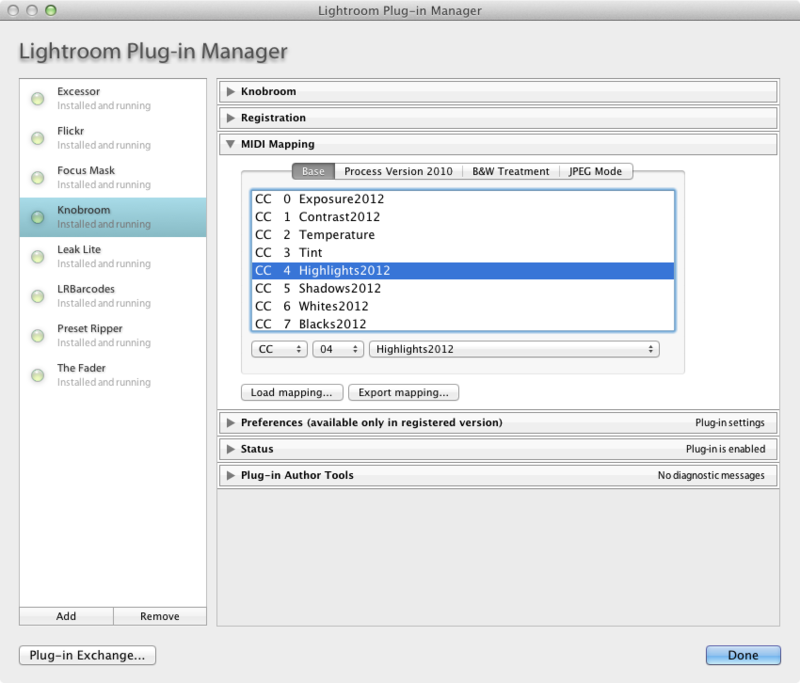 or remove Knobroom.lrplugin directory when Lightroom is not running. usage. The version will expire by December 31, 2010. Extras does not work properly. list is not properly updated later on. is not set to Custom white balance. input. The process is connected to Lightroom using TCP socket 56627.
port manually or be prompted to accept connections.